Last night’s sold out show at Indianapolis’ Murat Theater brought one of the greatest showmen in rock, and did not disappoint devoted fans. 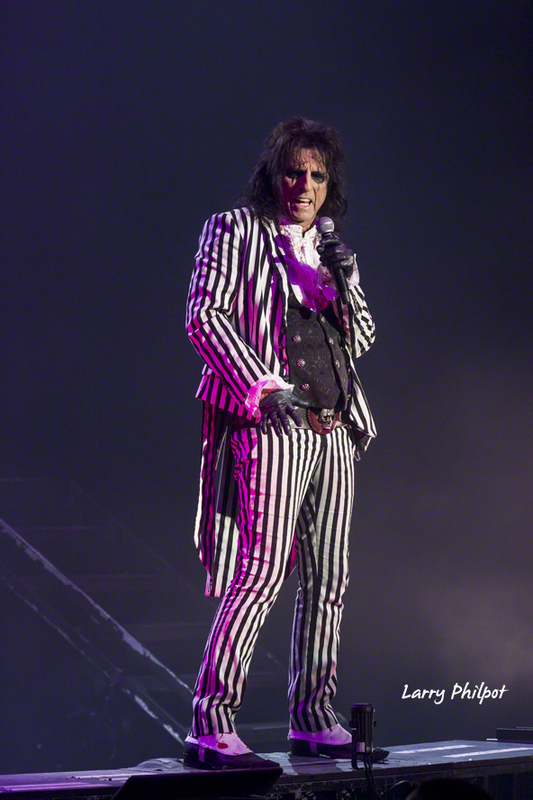 Alice Cooper pioneered a grandly theatrical brand of hard rock that was designed to shock, commonly called shock rock. His over the top theatrical show features guillotines, fake blood and dead babies. In a career that spans five decades, Cooper has amassed 26 studio albums, 10 live albums, and 46 singles. Wednesday’s show, in a much smaller venue than last year’s show where Cooper easily upstaged headliner Motley Crue, was still loud, still over the top, and went deep into Cooper’s vast library of lesser known songs. As “I Love The Dead” was concluding, Cooper’s A-list band did covers of songs by The Who (to honor Keith Moon), Motorhead (for the late Lemmy Kilmister), and performed Suffragette City in honor of the late David Bowie. Glen Sobel: One of the best drummers in the business, Glen has played in a variety of genres including rock, hip hop, pop, metal, punk, and fusion. Recently he has played, toured, and/or recorded with gigs ranging from hard rock (SIXX A.M.- featuring Nikki Sixx of Motley Crue). Recent live events have found Glen playing behind such heavyweights as Steven Tyler, Rob Halford, Weird Al, Pat Simmons & Michael McDonald of The Doobie Brothers, Robie Krieger of The Doors, Ke$ha, Orianthi, Johnny Depp, Mike Meyers and many more. Chuck Garric is an American song writer and bass player. If you’ve been to an Alice Cooper concert in the last 11 years, then you’ve seen Chuck Garric on stage. Chuck has played on the last 4 Alice Cooper records. 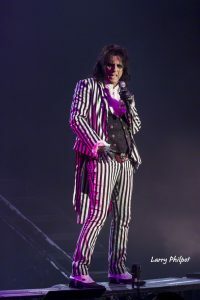 Chuck and Alice have written many songs together in support of those albums, most notably the song Dirty Diamonds which finds its way into the set list each year and has become a classic Alice Cooper song and fan favorite during the live shows. Chuck is also very proud of his time playing bass guitar for Ronnie James DIO. 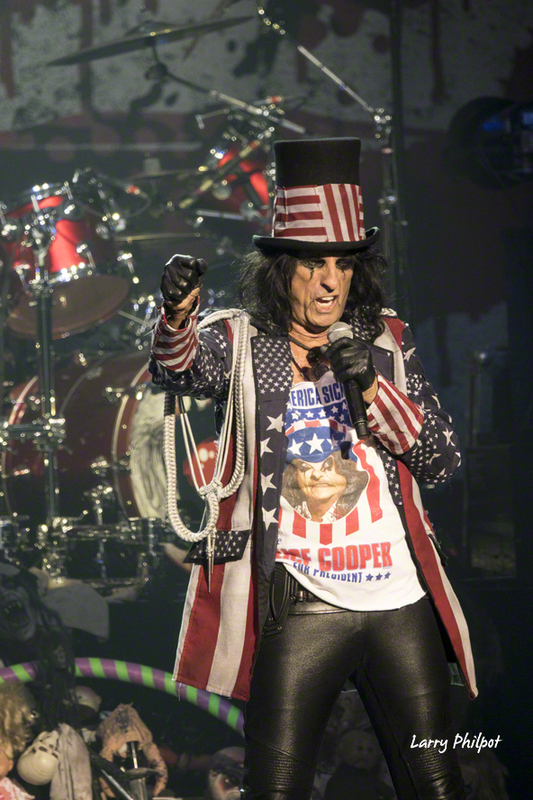 Guitarist Ryan Roxie continues to ‘Enjoy the Ride’ with the Alice Cooper Band. He appreciates the busy schedule and when he’s not touring with the Coop, he’s releasing albums with his bands (Roxie 77 and Casablanca). both bands coming out of his newly adopted home country of Sweden. Roxie first joined the AC Band in 1996 and appeared on every Alice Cooper release for the following 10 years. 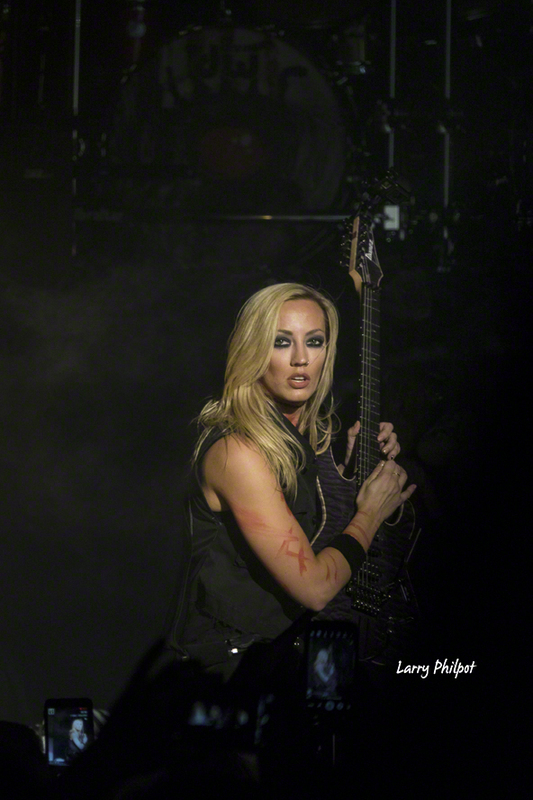 Los Angeles born guitarist Nita Strauss has become a force to be reckoned with in the music world, dazzling audiences across the US, UK, Europe, South America, Asia and Africa, and sharing the stage with a diverse range of artists including legendary R&B star Jermaine Jackson, early MTV darlings Femme Fatale, video game supergroup Critical Hit and popular tribute band The Iron Maidens. Her skill, exuberant stage presence and love for all things about her instrument have earned her a stellar reputation and endorsements from many top companies. Nita has been featured in many worldwide print ads and on dozens of albums, trailers, and soundtracks, most recently Heroes Of The Storm (Blizzard) and Grammy-nominated Metal Gear Rising: Revengeance (Konami/ Platinum Games), and is the author of the Premier Guitar column “Drop Dead Shred”. She was ranked first in the Guitar World article “10 Female Guitar Players You Should Know”, and has been featured in Revolver Magazine’s annual “Hottest Chicks in Hard Rock” issue and calendar for the last 2 years. In 2014 Nita became the official in-house guitarist for the LA KISS, the arena football team owned by Paul Stanley and Gene Simmons of KISS. Check out the full photo gallery from the show, below. All images by Larry Philpot.